A Piso fare treat for our 1,000,000 Facebook Fans and counting! 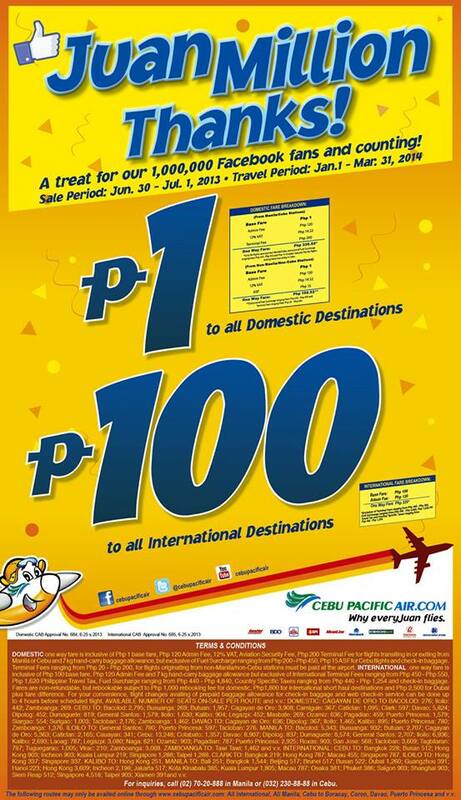 Cebu Pacific is having a Juan Million Thanks!, Piso Fare seat sale. At exactly 12midnight today (Sunday, June 30, 2013), The budget airline launches its newest Piso Fare for all of its Domestic destinations and P100 to all International destinations. This promo is a treat for their 1,000,000 Facebook fans. hi i just saw this ad today July 2, 2013 is it too late? ah hindi kase 1 yan eh so 2 ka nag post..baliktadin mo orasan mo...tanga! how to avail this international flight ? Hi just saw it today,,, meron pa ba for march 2014. Hi just saw it today,,,meron pa ba fir march 2014!